There are over 80 national parks in India, spread all over the country. Some are larger and more accessible then others. These parks are all popular with visitors, and offer a diverse variety of flora and fauna. If there are specific types of animals you're interested in, discover where to find them at these Top Parks to See Wildlife in India. For a special experience, stay at one of these Top Wildlife and Jungle Lodges in India. India's first national park, Corbett was established in 1936 by legendary tiger hunter Jim Corbett. It's located around three hours from Nainital and seven hours from Delhi. The park is a large one and has five zones. One zone, Jhirna, is open all year round. The rest of the park closes during the monsoon. The chances of seeing a tiger at Corbett aren't great but there are other animals, and elephant safaris are possible. For the best wildlife viewing, stay deep in the reserve in the Dhikala zone. However, if you're a foreigner be prepared to pay double the rates for accommodation, with the cheapest rates around 2,500 rupees a night for a private cabin at a forest rest house. More information is available from the park's website. Ranthambore is a fascinating blend of history and nature. Inside the park is a formidable fort that was built in the 10th century and coveted by many rulers due to its strategic position between north and central India. The park itself is characterized by rocky plains and steep cliffs. It supports a diverse range of flora and fauna, including around 30 tigers. This park is very popular due to its proximity to Delhi and the fact that tigers are relatively easy to spot there. However, the park's popularity has resulted in overcrowding and mismanagement of safaris, which is a problem and something to be aware of. Kanha National Park has the honor of providing the setting for Rudyard Kipling's classic novel, The Jungle Book. It's rich in lush saal and bamboo forests, lakes, streams and open grasslands. This large park is well regarded for its research and conservation programs, and many endangered species have been saved there. As well as tigers (the chance of seeing one has increased dramatically in recent years), the park is known for its barasingha (swamp deer) and an extensive variety of other animals and birds. It's perfect for nature lovers. Pench National Park gets its name from the river that runs through it, dividing it into east and west halves. Like Kanha National Park, Pench is also associated with Rudyard Kipling's The Jungle Book. A place of wild natural beauty, it has open hilly terrain, teak forests and thick vegetation. This well-managed park is renowned for river rafting and is a great place for bird watching. Tiger sightings are quite common on safari, along with many other animals. An additional attraction is the potters' village that's situated near the park's Turiya gate. Bandhavgarh is best known for its spectacular setting, as well as having the highest concentration of tigers in any park in India. The park features dense green valleys and rocky hill terrain, with an ancient fort built on 800 meter (2,624 ft) high cliffs. Although it's relatively difficult to reach, this park offers among the best chance of seeing tigers. 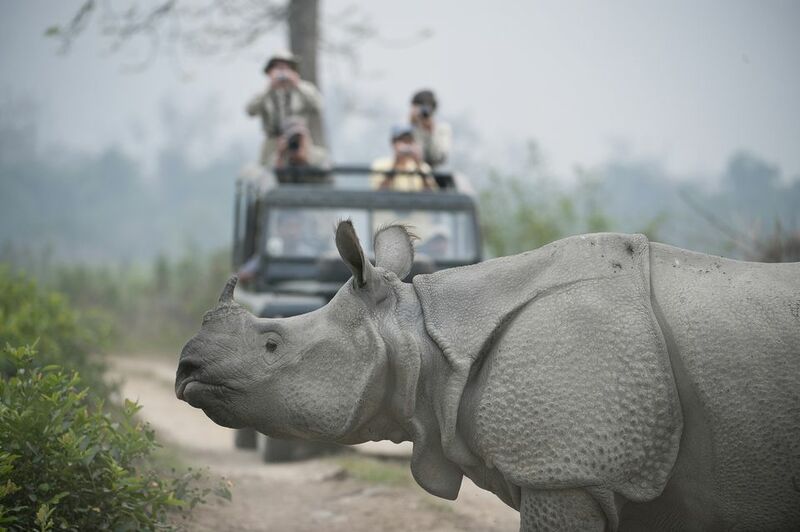 Much of Kaziranga National Park consists of swamp and grasslands, making it the perfect habitat for the one-horned rhinoceros. The largest population in the world of these prehistoric looking creatures exists there, along with almost 40 major mammals. This picturesque park can be explored by elephant safari. It sits on the banks of the Brahmaputra River in India's Northeast, approximately six hours from Guwahati. Sundarbans, one of the top tourist places in West Bengal, has a magnificent tangle of mangrove jungle that's the largest in the world.. The Indian part is made up of 102 islands and just over half of them are inhabited. The Sundarbans is only accessible by boat and exploring it this way is a thrilling experience that shouldn't be missed. Don't be hopeful of seeing any tigers though. They're very shy and usually remain well hidden in the reserve. A highlight is staying in eco-friendly village accommodations and enjoying community-based tourism. This high altitude alpine valley is a glacial corridor that comes alive during the monsoon season with around 300 different varieties of alpine flowers. They appear as a bright carpet of color against a mountainous snow capped background. The Valley of Flowers requires a strenuous hike but you'll feel on top of the world in this magical and enchanting place! One of the most famous national parks in south India, Bandipur is part of the Nilgiri Biosphere Reserve. It was once the the private hunting ground of the maharajas of Mysore. This substantial 870 square kilometer park receives a lot of tourists as its located on the way to Ooty from Mysore. It does have tigers, although they're rarely sighted. You're more likely to see deer and monkeys on safari (and maybe elephants if you're lucky). Nagahole is officially known as Rajiv Gandhi National Park and it's also part of the Nilgiri Biosphere Reserve. The Kabini River runs between Bandipur and Nagahole, and it's not unusual to see herds of elephants on the river bank. The Kabini side of Nagarhole has some outstanding luxury safari lodges. Mudumalai National Park, not far from Ooty in the Nilgiri district of Tamil Nadu, shares its border with Kerala and Karnataka. More than 260 species of birds (including peacocks) are reportedly found there, as well as elephants, tigers, deer, monkeys, wild boar, bison, and leopards. Tree house accommodations are a popular feature at many of the properties around Mudumalai. One of the top places to visit in Himachal Pradesh, the Great Himalayan National Park became a UNESCO World Heritage Site in 2014. The park has four valleys and covers more than 900 square kilometers. Its remote, rugged and untamed terrain makes it sought after by trekkers but only the fittest and most adventurous reach deep inside the core area. Another top national park in Madhya Pradesh, Satpura National Park is notably one of only a few protected forests in India that visitors are allowed to walk through. It's a relaxed place, without the usual hordes of tourists. The hilly scenery is quite dramatic too, with gorges, waterfalls, and ancient rock paintings. One of the best treks is the Duchess Falls Trail. It's challenging but you'll be rewarded with a refreshing dip in the waterfall at the end. Other possible activities inside the park include cycling, jeep safaris, night safaris and canoe safaris. If you don't care about seeing a tiger, this park is a wonderful place to enjoy nature.